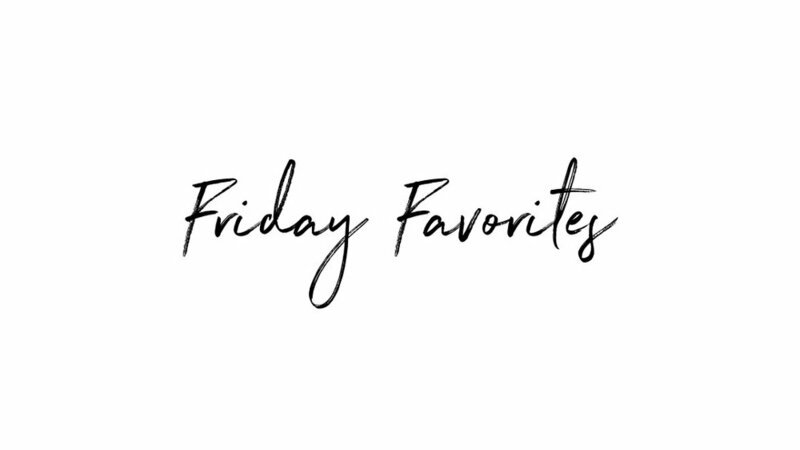 Yay Friday Favorites is here! Enjoy! Super cute, a great price point, pretty much your go to spring and summer tote for all things under the sun. Would it be a Friday Favorites without something from Old Navy? I don’t think so. I picked up this dress this week and it’s so flattering (hello mom bod) and so soft. A winner all the way! But seriously, it’s 70 calories per serving and IT”S SO GOOD. A pantry staple in this house and I may have gone through like 3 bags this week…just sayin’. The great thing about this lightweight towel is it’s multi functional. Use it as a beach towel, wear it as a sarong, use it as a tablecloth too! Comes in a plethora of colors! I Originally heard about these from my favorite beauty blogger, Kate Bryan. I’m not a huge makeup person and these are perfect! The colors are so gorgeous and I love that they feel lightweight. Ok, I’m pretty sure this is our family’s favorite item perhaps of all time. Basically, it comes with a built in email address, you can email photos and videos up to 2 minutes long and they literally beam to the frame and pop up on the screen. It’s amazing and so easy to set up and use. A Grandparents dream! If you follow me on Instagram stories you’ll know I’m slowly (we’ve only lived there a year and a half- hah) making our house a home. I’m loving the idea of a bright and fun bathroom for Caroline and I think this bath mat is perfect! How fun, right? Ok, so I’m not sure how baby wipes can bring me joy, but these are great! We were hooked on the Honest brand wipes forever, but tried these out and I have nothing but good things to say, it doesn’t hurt that they are wayyyy less than Honest wipes. If you don't follow me over on Instagram, then I have a little surprise for you! Schmidt Baby #2 will be here early July! I know, it's the craziest thing. I shared a quick story about this wonderful surprise when I announced a couple of weeks ago, but basically the last thing I was expecting was for two pink lines to show up back in October. It was such a shock and I think I was in a blur for a good few weeks. The plan was most likely fertility treatments again in about a year, but little did I know there was another plan entirely and Chris and I are so so thankful. Monday will mark 24 weeks pregnant and I've been thinking about creating a small bucket list of things to do with Caroline and to get ready for 2 babies before our next little one is here for a while now. It's a simple list of things. No fancy trip to Thailand or anything like that. But it's a meaningful list of things I'm looking forward to so much while it's just the 3 of us. I also include a couple practical things that are needed to ensure we are fully prepared for little one #2. Hah, so swimming lessons might be a stretch, but Caroline started "Introduction to the water environment" or "mommy and me" classes that run all through March! It's mostly so can dote on her in her cute little Gap swimsuits, but I am excited to start her relationship with water this soon! She wasn't thrilled about her first session, but I'm hoping she likes it a little more each week. This tip I picked up from multiple friends and online articles. We are mostly set up in our family room right now, but I'm thinking we'll transform the living area in our basement to become our little spot during the week. We'll have toys for Caroline, a spot for baby, a pumping station, and changing table. Plus there's a tv and little kitchen down there too so I can be fully self-sufficient while we get into our new groove. The Richmond Squirrels are a thing around here and I can't wait to document Caroline's first official Spring game. I am sure she'll only last a little while, but thanks to $6 tickets, I can handle that. I think this bucket list item is mostly about getting outside and doing something a little different. That, and I know we will be a bit boring and housebound most of the summer so I'm taking full advantage of April and May. This is another one to get us outside (and another one probably solely for my enjoyment, but I would love to take Caroline to a few Richmond farmer's markets where we can buy fresh fruit and veggies and pick out flowers for the kitchen island. There is of course a short list of needed items for baby #2, but at the top of that list is a double stroller! We almost bought a stroller that converts to a double before Caroline was born after I read a Lauren Conrad baby registry article that suggested this tip, but in the end I just added a simple single stroller to our registry. Fast forward to right before Caroline was born, a neighbor of ours gave us a used little stroller caddy that matched exactly with our carseat. We didn't buy the adapter for our new stroller so for 8 months I've just been using the caddy because Caroline is still in her infant carrier carseat while the pretty new one sat in a corner-so sad. With baby #2 on the way we now absolutely need a double stat! I'm really wanting the Baby Jogger City Select with a hefty $700 price tag-ugh. So may settle for a cheaper model. We have the Chicco Keyfit 30 carseat so it has to be something compatible or with an adapter. This type of stuff gets overwhelming for me-so many options! This is another tip I picked up from an online article. Because there will be a new baby, I want Caroline to have a little baby of her own to take care of. I'll probably introduce it to her in late May or early June to get her introduced to "baby." We started KIndermusik this week and I really enjoyed it! Most of the time it's just me and Caroline so it was fun to see her be social with other babies her age and learn new things from the teacher. I signed up for an unlimited package so we'll get to enjoy all month long! This time of year my weekends get really booked up, but I'm going to try and find one in April or May where we can sneak down to Duck NC for the weekend. Again, this will be another summer of no family beach trips or vacations, so I'd really love the three of us to get a weekend in OBX in. Obviously similar to the beach, but we'll have about a month between our neighborhood pool opening and the baby arriving so I'm counting on a few days in there with some quality time at the pool! I'll be huge, but who cares! Finishing Caroline's first year baby book, filling her special box, uploading all her photos taken to her special email address, creating her first year book, etc. are all part of this bucket list item. Her first year will always hold a special place in my heart as it will be the only year ever where it's just me and her and I want to make sure it's documented as best it can be. The last celebration before she is a big sister and I want it to be special. We're holding her party a few weeks early because of weddings and then not getting too close my due date. Mostly just family, but it will be here at home and we're planning on just a simple summer theme. I may be adding to this list, but in the meantime you can bet I'll be making the most of the Spring and the last 3 months before we're bringing home another baby!